Alexandra, my friend who invited me to join her and her group on a field trip to Jingdezhen last February, asked me if I could make a soap collection inspired by our trip. She suggested Jiangxi Orange for which Jingdezhen is famous for (aside from porcelain), and Green Tea. Naturally, the soaps must contain kaolin clay – a key ingredient in porcelain and a wonderful soap additive. The first soap I made was Green Tea. For the entire formula of 1,500 grams of oils, I used 20 grams or 2 Tbsp of kaolin clay, and 5 grams of titanium dioxide. I mixed these into a paste with some of the yogurt I used in the recipe, maintaining my lye concentration at 37%. The result was a very hard bar of soap! It was a bit brittle, but not crumbly. I made a lovely Taiwan Swirl for the top, but I was so disappointed to find traces of pink. I loved the celadon-ish green (1/4 tsp green chrome oxide to 1000 grams of soap batter containing kaolin and TD) and the pattern from the drop swirl. To salvage the soap, I chopped off the tops. I wish I had taken photos of the mysterious pink, but by the time I was going to take photos a few days later, all traces of pink had disappeared. Pretty tops cut off. They originally had pinkish stains but disappeared after a few days. Has anyone experienced getting pink from out of nowhere on the surface of their soap? I used my standard recipe and tried-and-tested fragrances. I am wondering if it was my yogurt that was quite sour? I got more pink appearances on a remake batch of Citrus Berry I made the following day. Same thing happened – it disappeared after a few days. Next, I made Jiangxi Orange. The colour of my first try came out peachy. I made another batch, and this time it came out reddish-orange – not what I imagined – but I was happy with the way it looked. I mixed 18 grams of kaolin and 5 grams of TD with extra water. I mixed the kaolin and TD paste into a little more than half of the soap batter. With the extra water, this batch was not as extra hard as the Green Tea. Even though my friend asked for only 2 kinds of kaolin soap, I made a third one that is supposed to be a Ming blue. I mixed 3/4 tsp ultramarine blue and 1/16 tsp black oxide into 900 grams of soap batter. It is scented with Yuzu, Vetyver, Black Tea and Tangerine – a fresh, sporty, and masculine blend. Everything about this soap screams Blue Jeans. Sorry, it ain’t a Ming. I find that at my usage rate of 2 tsp kaolin per 500 grams of oils or 1.33% of my oil weight, the soap’s lather is very fine, but noticeably less. It would make a nice and gentle shaving soap, but personally, I prefer a sudsier bath soap. For more on kaolin clay, Maya of Infusions Blog and Gordana of Moj Sapun have written about their experiences with it. This entry was posted in Cold Process, Perfumed Soap and tagged Jingdezhen, kaolin, Kaolin in Soap on April 9, 2014 by soapjam. Thank you, Sharrielynn! Kaolin is a nice soap additive. It’s good for the skin, helps hold the scent, and gives soap a more opaque look. I hope you give it a try. They really make a wonderful collection, inspired by your recent trip. I like your soaps,they always look so clean, precise and smooth. I’m eager to see how you will pack them, are they going to the wooden tray? I still have a lot of the wooden tray, but my soaps have grown a bit bigger, so now they don’t fit in the tray! I have to find another use for the trays. Thank you for your compliment, Maja. I try to make my soaps as clean and smooth as possible, but I do have my share of rejects! I had a few batches of rejects two weeks ago. I was starting to get discouraged, but luckily the soaps I made last weekend turned out well. Gorgeous colours Silvia! So fresh and pretty. Your swirls always come out fantastic. I think my favourite is the green, it’s such a clean looking soap but you’ve also nailed the Ming blue. Thanks, Monica! Sigh, I wish the swirls always came out pretty. I like risking with new scents, and I suffer the consequences. I still have to learn to make small batches with new F.O.s. What a great memento from your time spent there. They are all stunning Silvia, truly. A beautiful collection of soaps. What a great idea to remember a vacation. Silvia, this is really gorgeous! 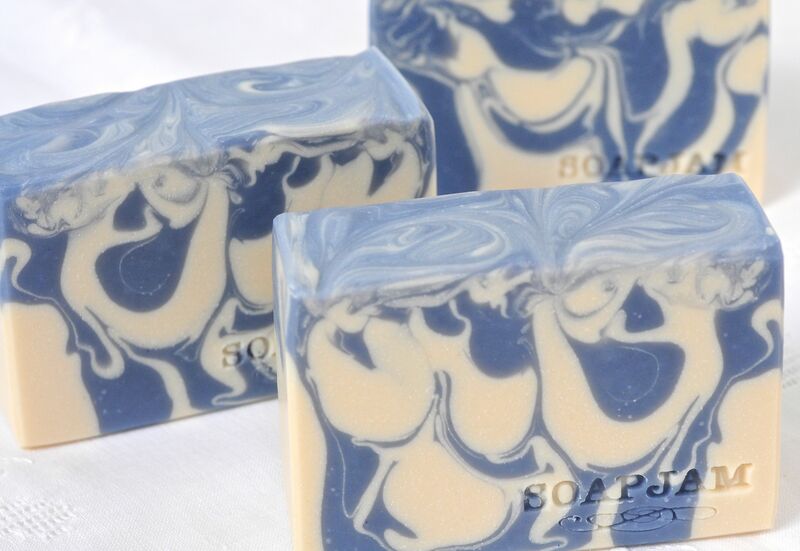 I can’t imagine that any soap can have better swirls than yours! You really inspired me to try mixing kaolin with colorants! Please do try mixing a little kaolin with colors. I feel it’s a nice variation. I really like the way the green oxide with kaolin clay came out in the green tea soap. What beautiful soaps! I love your swirls! I love the green tea & Ming (I’m not a fan of anything in the orange family). Did you do a drop swirl? Thanks so much for the info on Kaolin Clay. I tried it in two of my batches a week ago. I also added a little TD in first batch and have never had such a beautiful white before. Thay also popped out of the molds much easier & cleaner, with no breaking or crumbling. I did notice that the soap seemed to trace faster, which I need to take into account when I want to soap at emulation for intricate swirling. I did not know that Kaolin would produce a smaller or less lather. It will be interesting to try when they are cured. I vaguely remember having some soap that got a little pink, but then it went away….I wish I payed attention to the circumstances. I would love to hear if anyone else has experienced this. Like you, I like using kaolin clay together with TD. Yes, the technique I used for this collection is the drop swirl. I have a group of people that are interested in purchasing my soaps and I send them a weekly email of new soaps available. I have been selling this way and to a couple groups I am involved in. Love this soap collection, Silvia And the swirls came out perfect!Love especially the blue soap! Thanks for the tips on using Kaolin clay. The soaps are gorgeous! Just curious on how is one of the soaps brittle? Among the 3 soaps, Green Tea soap contains the highest amount of kaolin without extra water to compensate for it. Freshly cut, the trimmed ends of my soap are normally flexible, but with the Green Tea soap, it was stiff and hard. No crumbling though. Gorgeous soap, as always =) The chopped soap looks great. I wonder what that pink was? It’ll forever be a mystery. Wow, those are all such gorgeous soaps, Silvia! I love those swirls. The mysterious pink sounds so interesting. I wonder what that was all about? Soap does crazy things sometimes.